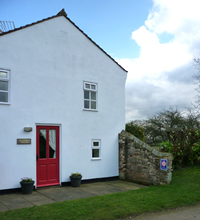 "Humphrey Cottage" is self-catering and sleeps 4. It is part of the windmill complex and so has the advantages of the onsite tea rooms and bakery, a large garden and children's play area. In the evening, the location is idyllic, tranquil and spacious. 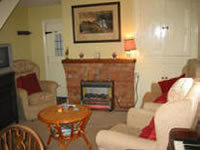 The cottage can be booked by the week, starting on Friday, or for short breaks, weekend or mid-week. A deposit of £50 secures your booking, the difference to be paid 3 weeks prior to arrival. If you would like to book, please contact us. Living Room: The living/dining area is downstairs, there is a colour television and video, a radio/CD/tape player and comfy chairs. The dining area has a dining table and chairs and a high chair is available. The living room has a south facing door into the garden, so why not breakfast outside on one of our picnic tables. 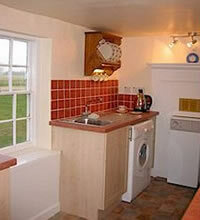 Kitchen: The kitchen is next to the dining area and is fitted with dishwasher, fridge/freezer, washer/dryer, microwave, kettle, toaster and electric cooker (ceramic hob). A full compliment of cutlery and crockery is provided, and even a bread making machine for the more adventurous. 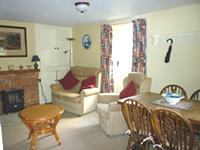 Tea, coffee, sugar, salt and pepper are provided and in the fridge you will find a pint of milk and a cream tea to welcome you. 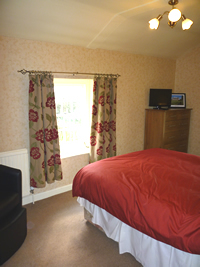 Bedrooms: Upstairs are two bedrooms, the main one has a double bed and leading off is the second bedroom which is fitted with full size bunks. All linen is provided free of charge. A cot is available if required. 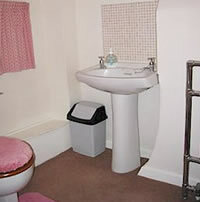 Bathroom: The bathroom is upstairs and is fitted with a Mira power shower, bath, basin, WC and heated towel rail. Towels are provided free of charge. Electricity, hot water, linen and towels are all included in the price. Cot and high chair are available if required free of charge. A barbeque is available if required, free of charge. Dogs are welcome by arrangement. 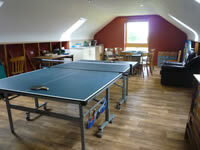 The new games room is also for people staying in the Cottage - it has table tennis and games and puzzles in it. 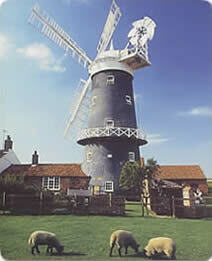 Surrounding Area: The cottage is beside Bircham Windmill with tearooms, bakery, gift shop, garden and play area. The surrounding area is superb for walking, cycling and bird watching with beaches only six miles away and many country pubs. 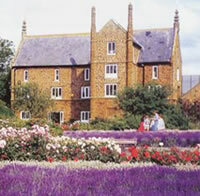 Local attractions include Sandringham House and Norfolk Lavender (pictured). Walk maps are available from the mill, as are cycle routes. Guests are welcome to bring their own bikes and we can provide locked storage for them. Local information is available in the cottage and tearooms and all our staff are happy to advise on their favourite local pubs and attractions.